In May 2003, President George W. Bush declared victory in Iraq. But if we won the war, we catastrophically lost the peace. Our failure prompted a fundamental change in our foreign policy. Confronted with the shortcomings of “shock and awe,” the U.S. military shifted its focus to “stability operations”: counterinsurgency and the rebuilding of failed states. In less than a decade, foreign assistance has become militarized; humanitarianism has been armed. 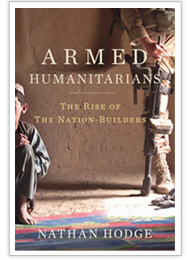 Combining recent history and firsthand reporting, Armed Humanitarians traces how the concepts of nation-building came into vogue, and how, evangelized through think tanks, government seminars, and the press, this new doctrine took root inside the Pentagon and the State Department. Following this extraordinary experiment in armed social work as it plays out from Afghanistan and Iraq to Africa and Haiti, Nathan Hodge exposes the difficulties of translating these ambitious new theories into action. Ultimately seeing this new era in foreign relations as a noble but flawed experiment, he shows how armed humanitarianism strains our resources, deepens our reliance on outsourcing and private contractors, and leads to perceptions of a new imperialism, arguably a major factor in any number of new conflicts around the world. As we attempt to build nations, we may in fact be weakening our own. Weapons of mass destruction may dominate the headlines, yet the public has little insight into current nuclear arsenals, plans for waging nuclear war, or even the purpose of deterrence. Concerned that rogue nations and terrorists are striving to acquire the atomic bomb, the United States and other nuclear-armed nations around the world are modernizing their weapons. The Cold War world of Dr. Strangelove has given way to a new and uncertain future of renegade weapons scientists, missing nuclear blueprints and atomic terror. 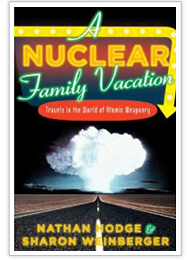 In A Nuclear Family Vacation, Hodge and Weinberger hit the open road to explore the world’s nuclear landscape. Along the way, they answer the questions most nuclear tourists don’t get to ask: Why are nuclear weapons still on hair-trigger alert? Is there such a thing as a suitcase nuke? Is Russia’s nuclear arsenal secure? Their itinerary takes them to top-secret locations, like Iran’s Esfahan Uranium Conversion Facility, the Semipalatinsk Test Site in Kazakhstan, the United States' Kwajalein military outpost in the Marshall Islands, and “Site R,” a heavily fortified bunker known as the "Underground Pentagon," rumored to be Vice President Cheney's “undisclosed location” of choice. Their atomic road trip reveals a unique perspective on the history of weaponry as well as the current state of affairs, as governments around the world face the nuclear question in the age of global terror. Weaving together first-class travel writing and investigative journalism, Hodge and Weinberger unearth unknown—and oddly entertaining—stories about the nuclear world in this absorbing and engaging exploration of the world’s vast nuclear infrastructure and the international politics at play behind it.